Phyllis Nye died this past week after struggling for two months. A memorial service was held on September 28th at Trinity. RIP. Saturday, October 6th from 9-2pm is Bark in the Park at the Italian Picnic Grounds. Bring your pet, stop by our booth, have your pet blessed and help Trinity be an active presence in the Amador Community. Entry is FREE! Saturday, October 13th at 5:30pm is the Gold Miner's Shindig at Trinity. Come for food, fun, fellowship, music, and slide show. We will unearth the treasures within our Trinity Community. Mark your calendars. Saturday October 20, 9 a.m. to noon, at St. Michael's-Carmichael is Convocation. This is the pre-convention meeting for our deanery. We will have time for fellowship and coffee from 9:00 to 9:30 and then have the meeting from 9:30 to noon. We will hear reports about resolutions, nominations, and budget in preparation for convention. We will also spend some time discussing further our purpose as a deanery and what kinds of collaborative ministries we can do among our congregations. All diocesan delegates and alternates should attend, plus all other interested people from our congregations. Friday, November 2nd at 7:30 is Trinity Night Out. Join us as we watch Amador High play Argonaut high in the BIG football game. More info to come! Choir/Music Rehearsals are the 1st & 3rd Weds of each month. Next one is Oct 3. Bring a water bottle and a heart for singing/playing! We have an appreciation for and do a combined service of Traditional and Contemporary worship music. Come on out, we'd love to have ya! "Whoever you are, wherever you are on your spiritual journey, you are welcome here." Bark in the Park: On Saturday, October 6th (9:00-2:00pm), Trinity Church will bless the animals at the Italian Picnic Grounds as part of the Bark in the Park Shindig.Entry is free. Bring your pet, stop by the Trinity booth, pick up a dog biscuit, and have your animal blessed. Trinity Church supports A-Pal and all those organizations who care for God’s creatures. Saturday, Sept. 22 - Our high holy day service between Rosh Hashannah and Yom Kippur. It will again be held in Copperopolis. Time TBA. You may call MLJC at 533-1650 or reply to this email or email us at motherlodejc@yahoo.com. to RSVP or for directions or further information. The MLJC’s mission is to provide opportunities and events that nurture a vibrant and enduring Jewish identity, culture and community in the Mother Lode; drawing its members from Amador, Calaveras, Mariposa and Tuolumne counties. There is no charge for this event and those interested in becoming new members are most welcome! 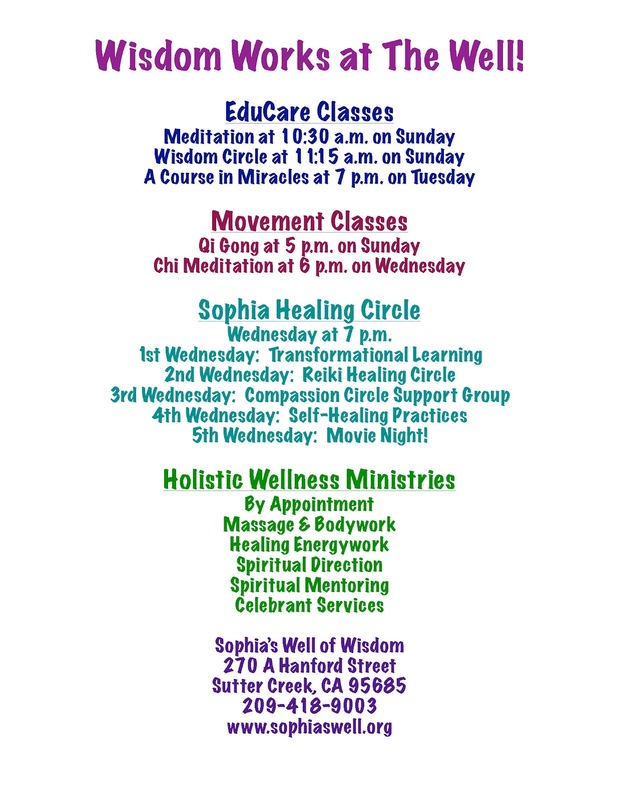 Autumn Equinox Celebration at Sophia's Well of Wisdom this Friday evening, Sept. 21 at 7 p.m.
Rev. Tracy Johnson will lead the celebration circle with inspiring and fun-filled events. This is a celebration of thanksgiving and joy in the natural cycles and seasons of life. The Well is located in Sutter Creek at 270A Hanford Street (across from the Days Inn). Contact Rev. Patsy at 209-418-9003 for more information. Next Movie Night is Saturday, October 6th at 6:30 PM, with The Passion of Christ. Men's Breakfast is cancelled for this month. Women's Breakfast September 22nd with Sherry Grimes' Art Class for Beginners, and continental breakfast and loads of fun! Our open-to-everyone clothes closet is every Thursday between 1 & 3 PM. We invite you to worship with us Sunday mornings, 10:30 AM and Sunday Evenings at 6:00 PM with speaker Karen Rose, and we enjoy favorite old hymns, too! 26675 Tiger Creek Rd at Hwy 88; In the Buckhorn Plaza. Saturday, September 29 at 10AM at Trinity Episcopal Church, Sutter Creekwww.trinitysuttercreek.org Registration information: Early registration (by August 15) $40. After August 15, registration fee $50. Space is limited to the first 40 registrants. A light lunch will be provided. Drums will be available for all. Pot Luck meal served off the Pool Table. 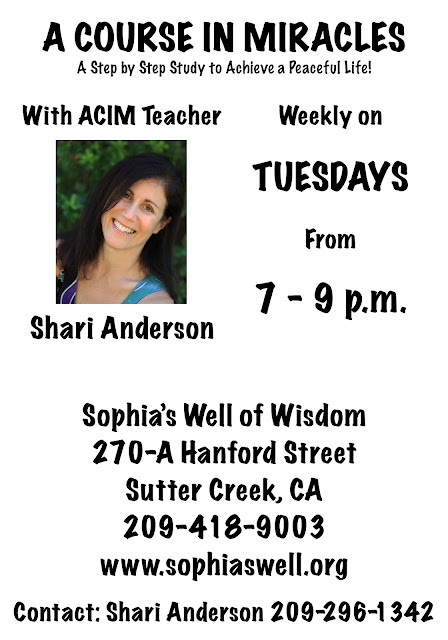 Just to let you know what's happening Wednesday night at Sophia's Well of Wisdom. First, at 6 p.m. Marilyn Nutter will lead the Chi Meditation class. The 30-45 minute class uses gently movements along with guided meditation to support both energy balance and healing affirmations. Following the Chi Meditation class at 7 p.m. Rev. Patsy will hold a weekly Sophia Healing Circle with a different focus each night. 2nd Wednesday - Reiki Healing Circle. Participants will receive a spiritual energy attunement, practice some energy-building activities, and share Reiki (spiritual energy) healing work. THIS REPLACES THE RHC FORMERLY HELD ON THE SECOND MONDAY. 3rd Wednesday - Compassion Circle. Participants practice compassionate speaking and listening using a group support format. 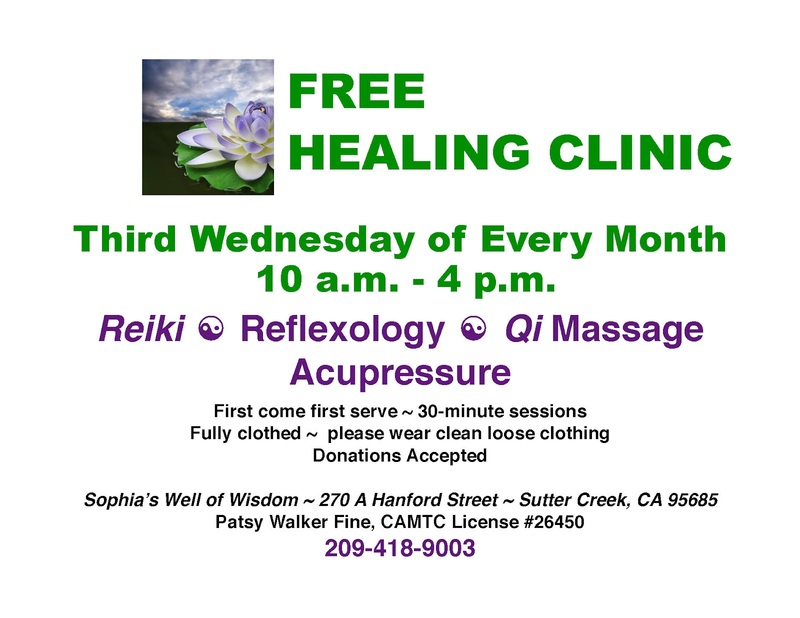 4th Wednesday - Self-healing Practices. Local teachers, healers, practitioners share various healing methods and activities that participants can use for self-healing. This month Patsy will share self-massage techniques. 5th Wednesday - Movie Night! Spiritual Cinemas and healthy popcorn. "Spiritual Wellness for Body & Soul"